In just a few weeks teenagers across the country will be dressing up in adult, formal attire and go to their last school dance. Schools, event planners, and production companies are gearing up to decorate their school prom with lavish party themes. The results are phenomenal prom photos on Social Media as the rest of the world enjoys themed productions that range from Vaudevillian and Moulin Rouge to the Great Gatsby, Oscar Night, and Camelot. 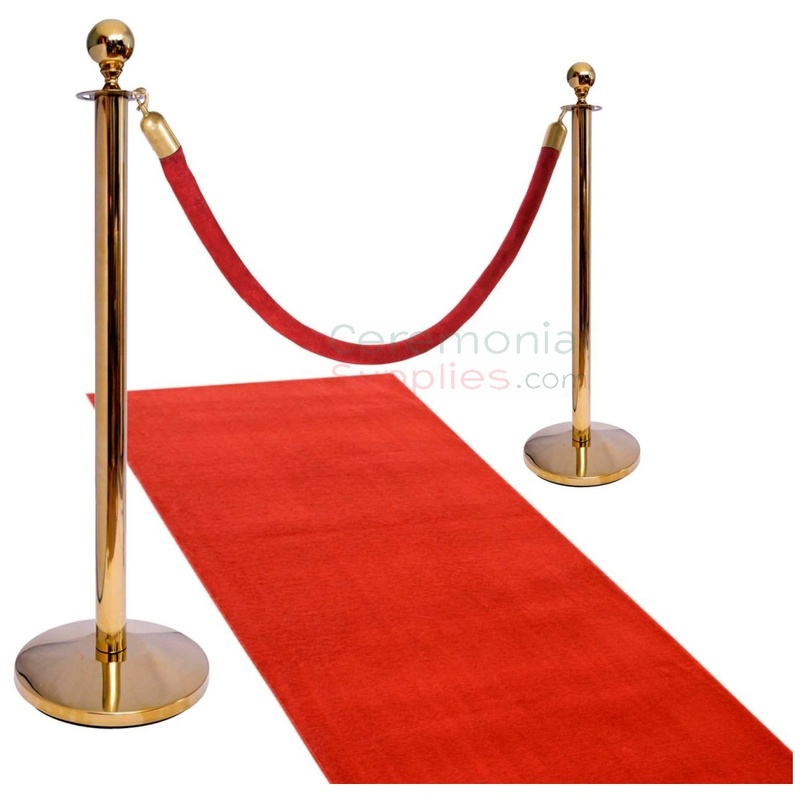 Glimmering stanchions with velvet ropes, extra wide personalized ribbon banners, are products that enrich any decor, but if you truly want prom dazzle, with ceremonial red carpet runners, with CeremonialSupplies.com you'll achieve that, and more! 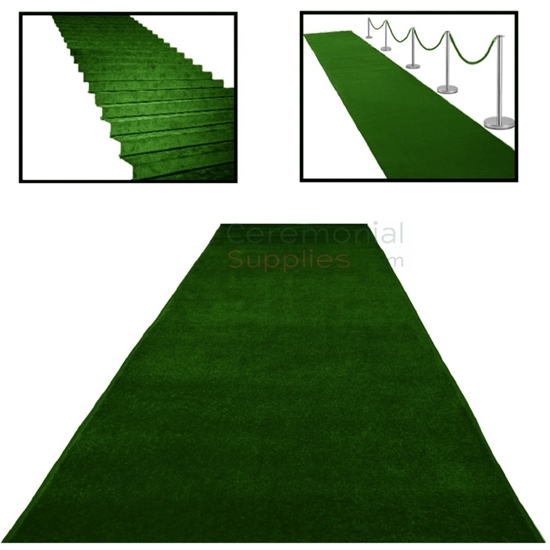 CeremonialSupplies.com has been consistently supplying school events across the country with the highest quality event carpet runners, at budget friendly prices to make your prom the memorable occasion it is meant to be. For convenience, we have a standard bright red carpet runner, and a standard royal blue event carpet runner, both of excellent quality and priced slightly less than our deluxe options. We also make available kits with the basic items for a posh red carpet entrance. The Ceremonial Crowd Control Kit consists of a ceremonial event carpet runner available in red, blue, green, pink, purple, and black; two polished brass stanchions; and velour stanchion rope. The ceremonial carpet is available in sizes ranging from 3 feet by 10 feet to 6 feet by 30 feet, with every combination in between in increments of 5 feet length. The pair of brass stanchions are 41" high and the stanchion rope is of fine velour. The Ceremonial Crowd Control Kit is the stress-free solution to the basic products for your red carpet prom arrival. Go ahead, dazzle them! If it's an authentic Hollywood theme you're after, remember all movie premiere's have the stars and celebrities pose in front of a step and repeat. This banner, with your school name and mascot logo gives all the official photographs the panache of an Academy Award presentation, and will make the last school photograph a vivid lasting memory. The step and repeat banner can be paired with a red carpet, or matched with another color event carpet runner that will match the school colors. Use customized or printed ribbons to highlight different areas, or for an overall "tightening" of the room, as well as draping them from the center out on the dance floor, or over the live band. Decorating the table settings with printed personalized ribbons is a way to keep color continuity, and become a treasured keepsake of the special night. CeremonialSupplies.com has an extensive selection of satin fabric ribbons available in 21 different colors and widths of 4, 6, 8, and 10 inches and lengths of 10, 15, and 25 yards! the light shine of the ribbon finish will be sure to make your personalized design stand out even more! Need more decorative items for your prom, balloons, signs, and banners? CeremonialSupplies.com is the place to get them. We ship wherever there's a prom going on, anywhere in the United States or the rest of the world, swiftly and efficiently. For the most dazzling prom experience, shop CeremonialSupplies.com! Click here for a shipping quote.